26 Resources to help you get your Middle School Life Skills class up and running. There data forms, work box set-up, task cards, math activities, and more to help you get started. Please scroll below to see included items. Click on items to review before purchasing. 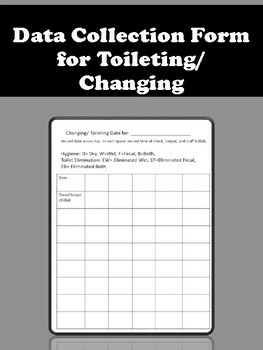 ​This is a one page data sheet that can be easily used by staff to document diaper and toilet training within your special education class. 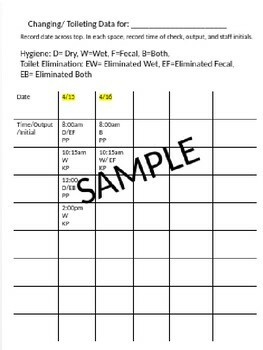 This form makes it easy to follow and determine baseline data to help zone in on when to target toilet training. The form has columns for a week's worth of data. There are boxes for staff to record the time, output, and their initials. This form has saved me many times when a parent has questioned changing or toileting practices. There are two styles. To use: Print, make copies, place on clipboard, and mount in the area where you plan to use it most. I like to hang a pen to the clipboard for easy access for staff, especially if changing diapers.